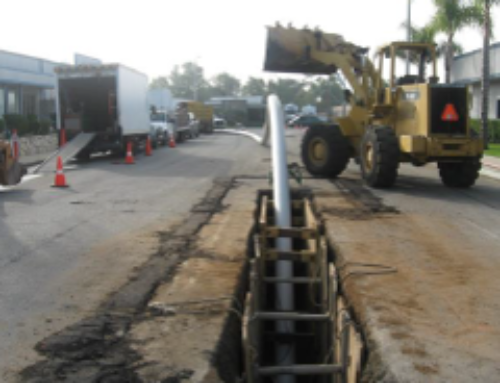 Hamilton & Associates performed engineering geologic evaluations as part of overall geotechnical investigations for construction of more than twenty (20) new sewer projects. Estimated total of design and construction services exceeds 80 million USD. This included evaluation of site geologic and groundwater conditions, preparation of detailed soil profiles pertinent to proposed tunneling and/or jacking techniques for pipe construction, assessment of seismic setting relative to nearby fault systems, and geologic hazard evaluations. Selected sewer projects are described below. 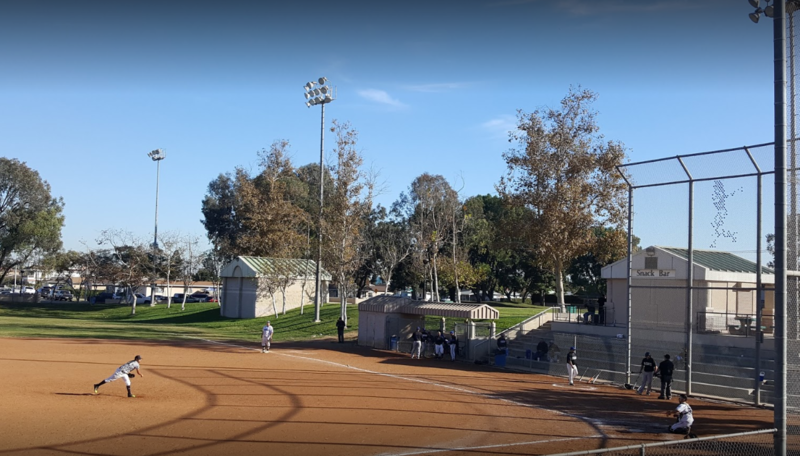 The project consisted geotechnical investigation for the construction of a sewer pipeline approximately 6,100 feet long and consisting of a 12-inch diameter high-density-poly-ethylene (HDPE) force main, and vitrified clay pipe (VCP) sewer and appurtenant structures. The project begins at the Spring Street Pumping Plant on Spring Street, extending southerly and westerly in private right-of-ways to 28th Street, then Dawson Avenue, 27th Street, Alley west of Dawson Avenue, Willow Street, then westerly to Orange Avenue. 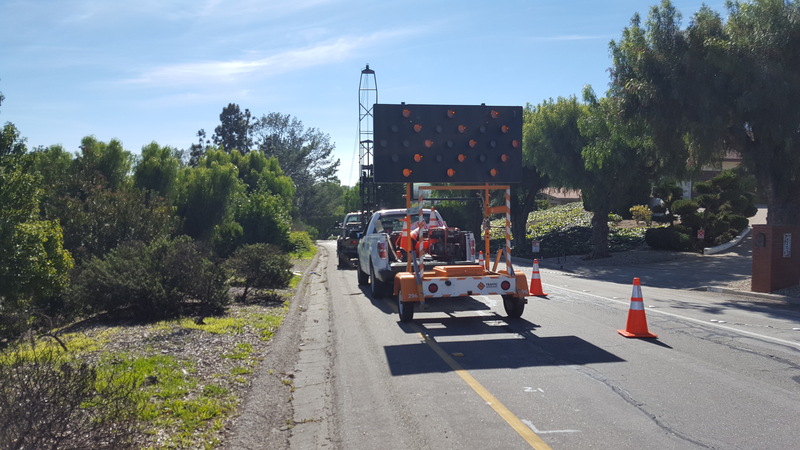 Prepared a Traffic Control Plan (TCP) for busy streets and cleared borehole locations through Underground Services Alert prior to drilling, and underground utility geophysical surveys per WATCH and MUTCD requirements. Geotechnical field exploration included drilling, sampling and logging 3 bucket-auger and 11 hollow-stem-auger borings, respectively 24 and 6 inches in diameter, ranging in depth from about 15 to 40+ feet. Recorded SPT blow count values in the field observed groundwater and caving, sloughing or “running” conditions, performed geotechnical laboratory testing, and prepared a geotechnical data report (GDR). Discussed main geologic units and groundwater conditions encountered along the pipeline alignment. Provided material property characterization, estimated lateral earth pressures and applicable surcharges for structural design of cantilever and braced excavations and recommendations for temporary trench excavations and shoring in accordance with Cal OSHA requirements. Performed excavation and logging of three hollow stem and one bucket auger exploratory boring using a truck-mounted drill rig. Groundwater level measurements and sampling were performed and spoils from each sample tested with an Organic Vapor Analyzer (OVA) and a combustible gas monitor. Our evaluation included field exploration, laboratory testing and report preparation. 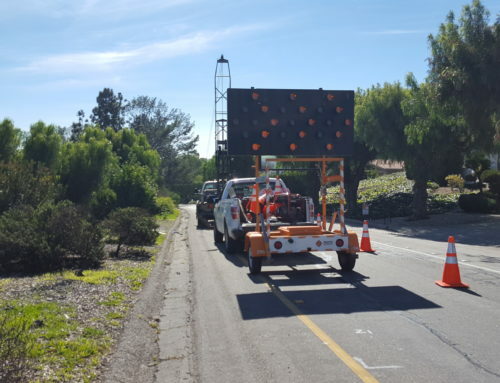 Reports described the results of testing and discussed a review and evaluation of other geotechnical reports and design evaluations, prepared by others, to satisfy Caltrans permit requirements for the proposed jacking, tunneling, and open excavation work along Pacific Coast Highway. 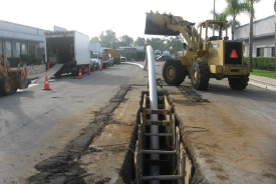 Project included geotechnical investigation for rehabilitation of approximately 10,400 feet of 63-inch diameter, semi-elliptical sewer by slip-lining with 57-inch, non-circular, fiberglass reinforced plastic liner pipe, as well as repair of four manholes. This project restored the structural integrity of the trunk sewer, which had moderate to severe structural damage resulting from hydrogen sulfide corrosion. 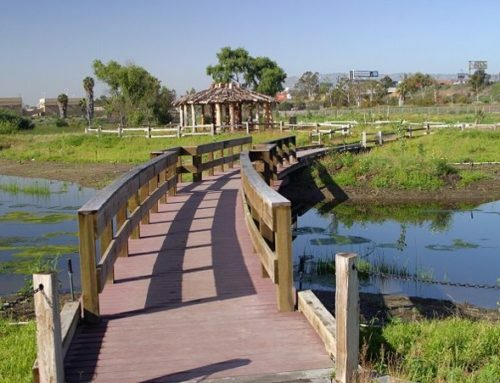 This pipeline is near-parallel to east and south of Freeways 710 and 91, respectively. 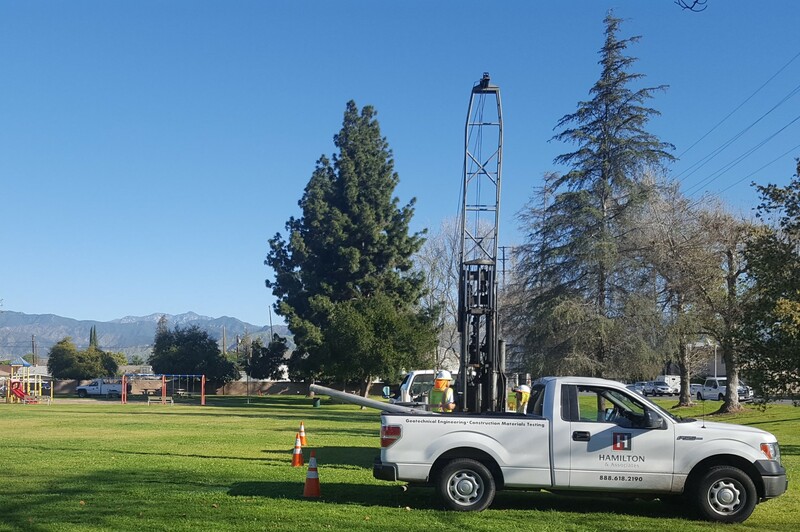 Geotechnical field exploration and testing included drilling 7 soil borings hollow-stem-auger borings, recording field SPT blow counts, performing geotechnical laboratory testing, and preparing a Geotechnical Data Report (GDR). Boreholes were drilled to depth of 25 to nearly 50 feet, with variable groundwater depths. Prepared a Traffic Control Plan (TCP) and cleared borehole locations through Underground Services Alert (Dig Alert) and underground utility geophysical surveys prior to drilling. Provided recommendations for trench temporary excavations and shoring per Cal OSHA requirements, including estimated lateral earth pressures and surcharges for structural design of cantilever and braced excavations. Districts of Downey, Pico Rivera, Commerce, Montebello of the City of Los Angeles, California. 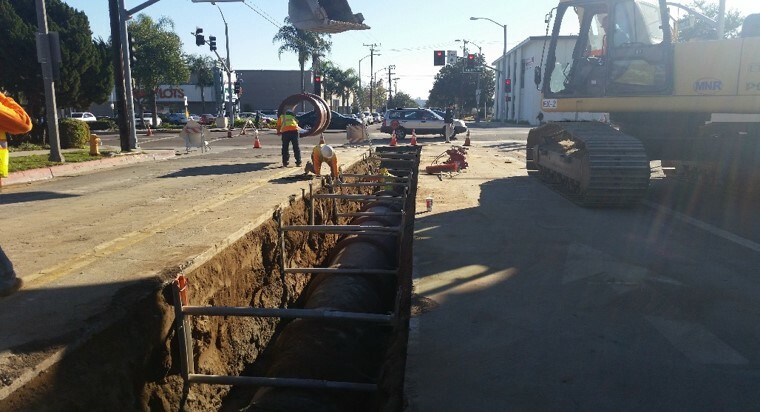 Geotechnical engineering for replacement of an existing Slauson Avenue Pumping Plant Force Main and gravity sewer pipeline, which were originally constructed in 1964. 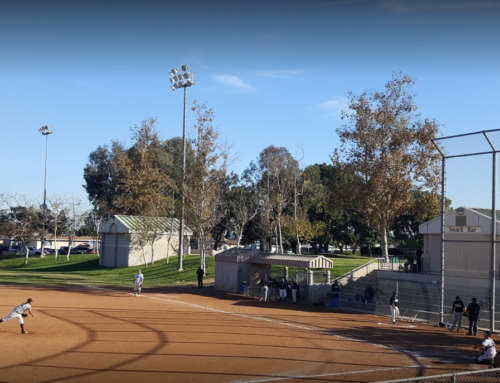 The project consisted of the construction of a new approximately 1,100 feet of 18-inch-diameter sewer, open-trench, micro tunneling vitrified clay (VC) or fiber-reinforced pipe (FRP). 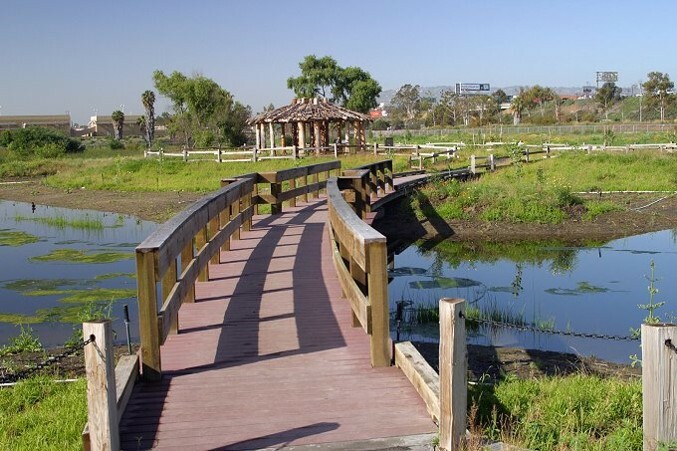 It also included jacking/tunneling approximately 320 feet long (within a 42-inch-diameter steel casing) and approximately 5 feet under the base of the existing Rio Hondo Flood Control Channel, within low-lying alluviated plains of the Los Angeles Basin, and construction of appurtenant structures and jacking/extraction pits, having a maximum soil cover of 28 feet. Geotechnical field exploration and field testing for a sewer pipeline, included reviewing of available data as well as drilling, sampling, recording field-measured SPT blow counts, and logging 4 bucket-auger and 3 hollow-stem-auger borings, respectively 24 and 6 inches in diameter, to depths of approximately 25 to 40+ feet. Performed geotechnical laboratory testing and provided recommendations pertaining to excavation, shoring, jacking/tunneling, and backfill for the proposed sewer. 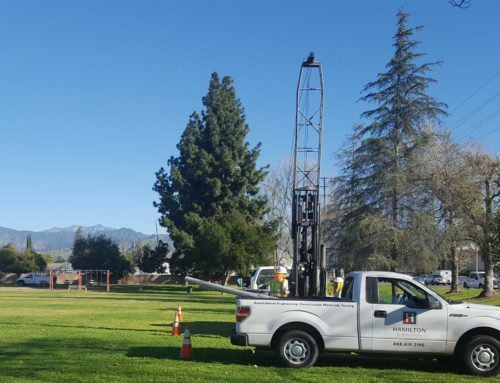 Secured permits and prepared a Traffic Control Plan (TCP) per WATCH and MUTCD; cleared borehole locations through Underground Services Alert (USA) and underground utility geophysical surveys. Laboratory testing included classification and index and engineering property tests of selected soil units. Report discussed alignment geology and soil properties, observed groundwater and caving, sloughing or ‘running’ conditions. Provided recommendations for temporary 30-foot-deep open trench excavations of the pits located at the ends of the jacking and/or tunneling section, and structural design of shoring in accordance with Cal OSHA requirements; this included estimated lateral earth pressures and applicable surcharges for structural design of cantilever and braced excavations.